Until recently, there were no reliable data regarding ground water level and groundwater conditions and risks within the Nam Ton Watershed. The knowledge was based on basic observations and interviews showing that shallow ground water may be found at a depth of a few meters up to 30 meters. Traditional wells in villages are tapping this resource, which can deplete rapidly according to the seasons and conditions of use. In the last decades, tube wells had been drilled generally for groups of householders and was equipped with hand pumps. The depth of the water is approximately 30 m (with of course spatial variability). This was described in the Basin Profile 2008. 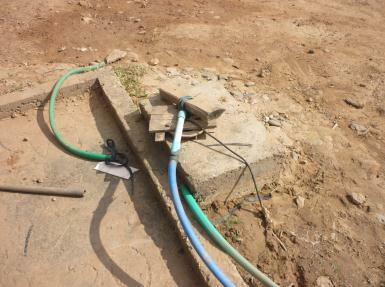 Those hand pumps could allow the tapping of the groundwater in a range generally less than 1 m3/hour. What is observed now is the rapid increasing in the number of "family" tube wells equipped with electric pumps. This is causing a change in the habits for the use of water for domestic purposes. 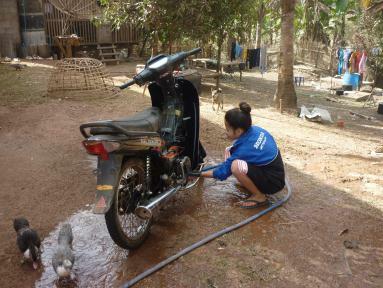 The water is also used for gardening in the immediate vicinity of the houses. It is therefore essential to get a good understanding of the recharge of the aquifers. It is likely that the rate of infiltration during the rainy season is high. In the upper watershed, the soils does not show signs of deep degradation and even the shifting cultivation, unless done on steep slope, should not change to much the infiltration rate. In the low land, the wide development of paddy fields constitute favorable conditions for recharging the aquifers. This situation can change in places where soil conditions are modified (mining, deforestation and earthworks, especially on steep slopes). Promoting the development of paddy fields in flat areas of the upper part of NTW in place where shifting cultivation is now practised and promote small natural reservoirs for rainfall harvesting is likely to have very positive impacts in terms of recharge of the aquifers and reduction of flash flood. In summary, the use of the groundwater may be a good opportunity for the future in terms of water availability for both domestic water and irrigation (using more advanced technologies such as drip irrigation and less-water consuming crops). In that way, tapping groundwater rather than surface water may decrease the present pressure observed on surface water and contribute to maintain and restore the aquatic ecosystems. On another hand, if the aquifer is over-exploited and if rules for tapping the ground waters are not implemented, particularly in the upper-catchment and in general in the shallow aquifers, it may be a threat for the whole surface water system. Estimate of the present situation and trends in terms of flood and drought and provide data to calibrate models that may show the impact of change in land use (e.g. deforestation, reforestation) on flood (mainly flash flood) and dry season flow. Indirectly, information related to erosion and sediment transport may be developed as well. Eventually, it should give better guidelines for selecting critical areas where strong conservative measure to protect (restore) forest, water and soil should be a priority. Establish up to what extent water allocation rules must be developed if the context shows critical situation in terms of water availability, this being especially applicable during the dry season. In this respect, the definition of minimum flow to be maintained in the streams during the dry season must be considered. Fine tuning irrigation efficiency by providing better estimate of evapotranspiration. This will be mainly applicable in case of development of new irrigation technologies (drip irrigation, sprinkler) and help increasing efficiency of irrigation. Get progressive understanding of the contribution of the groundwater system for maintaining of the Nam Ton base flow and identify possible critical areas where tapping of groundwater or resurgences should be better regulated. Check opportunities and threats of using groundwater resources. Provide information related to the contribution of the Nam Ton as part of the tributaries of the Mekong basin. The table below is a summary showing the topic that can be addressed by the Water Quantity Monitoring network, the related equipment and a quick overview of the methods to be used for data treatment. Observing value and trends of the lowest discharge and try to correlate with value and trends of groundwater level. Likely to be quite intuitive. 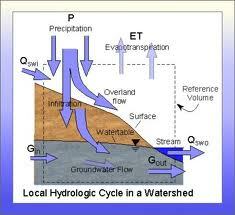 The key indicators that can be monitored refer to the hydrological cycle. Therefore, a water quantity monitoring network generally consists of measurement of the rainfall, the streams flow and the evapotranspiration. Streams flow is composed of the runoff, which is the water that goes directly to the streams after a rainfall and base flow which are the outputs of the groundwater system. Groundwater storage variation is the balance between infiltration and aquifer resurgences which is actually the base flow in the streams (may in other watersheds). It is much more complex to estimate, although it may be theoretically estimated from the general balance; Actually, the groundwater system does not correspond to the watershed limit and geology make that the groundwater reservoir is not necessarily uniform and continuous. Only complex modelling tools can generally partially help understanding the interrelation between infiltration and resurgences.